The West Vancouver Tennis Club is an active and social members-only tennis club with year-round tennis located in the heart of West Vancouver. 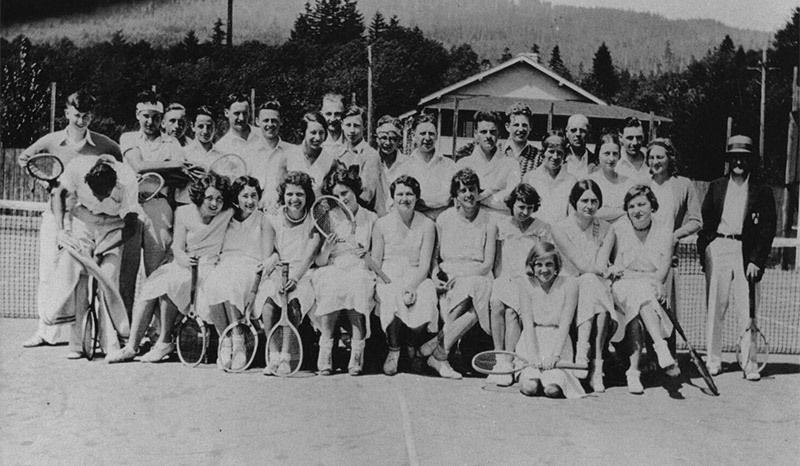 The club was established in 1925 and started out with only 3 clay courts and fewer than 50 members. Since then, it has grown to 5 hard-surface lit courts and over 550 members. In the winter, all 5 courts are covered with a heated bubble. The West Vancouver Tennis Club is a not-for-profit club and operates on leased land from the Municipality of West Vancouver. The club runs under the direction of 9 Board members, a full time club manager, several part time desk clerks and 4 tennis professionals. We offer private, semi-private and group lessons to both adult and junior members. Our junior programs are also open to non-members between the ages of 5 and 18. Under the direction of our Social Directors and volunteers, we host a number of events throughout the year including a weekly Sunday afternoon Social Drop-in, the Annual Club Championships, the Celebration of Tennis, a mixed doubles round robin, the Bollywood Calcutta and the Doubles by the Shore summer tournament. In addition, many of our members participate in the Lower Mainland’s inter-club spring leagues. We welcome players of all levels to consider joining our club. It’s one of the friendliest and most affordable tennis clubs in the Lower Mainland.